Immersive Panoramas - Photographic recordings of entire visual environments. These images from a single point of view are also known as 360x180° panoramas, or simply "Panos". Immersive Panoramas allow the viewer to look all the way to the left, right, up and down. 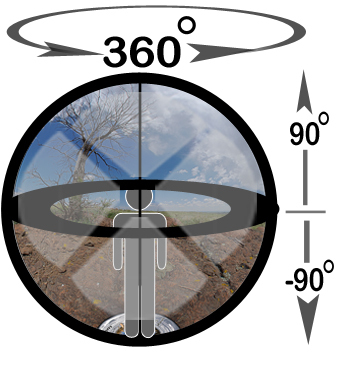 To help understand immersive panorama images, we've built this set of diagrams to help explain. Traditional photography allows for viewing only so far to the left and right of an environment. A panorama image displays a wider view than a traditional photograph. A 360° panorama image captures all the way around. A 360x180° immersive panorama image shows all the way left to right as well as all the way up and down from a single point. To view these images without distortion, we need a round device like a globe to do so. When an immersive panorama image is displayed on a flat surface like a computer screen, a software program known as "viewer" or "player" is used. There are a variety of these devices including Flash, Java and Quicktime that allow for the viewer to interact with the image by controlling the direction of the image. Click here to see our sample image displayed with a viewer.